Nobel Peace laureates, from left, Yemen's Tawakkol Karman, Iran's Shirin Ebadi and Ireland's Mairead Maguire address a press conference after their visit to the Rohingya refugee camps in Dhaka, Bangladesh, Feb. 28, 2018. Iran's government is facing increasing criticism from prominent Iranian lawyers angered by its decision in recent days to allow only a select few defense attorneys to handle national security cases. Iran's state-run Tasnim news agency published a report on Monday, naming 20 government-vetted lawyers who have sole approval from the Iranian judiciary to defend clients accused of security offenses. Iranian Nobel Peace Prize winner and lawyer Shirin Ebadi sharply criticized the Iranian judiciary's move in an interview with the U.S.-based Center for Human Rights in Iran (CHRI) published Tuesday. Ebadi, who lives in exile, is quoted as saying the selection of the 20 lawyers trusted by the government will lead to the "complete destruction" of the Iranian judiciary's independence and the public's right to legal defense services. "The most important issue is that all defendants charged with political or ideological offenses from now on will be deprived of their right to legal counsel," Ebadi told CHRI. Iranian state media said judiciary chief Sadeq Amoli-Larijani approved the exclusive list of defense lawyers for national security cases on the basis of Iranian Penal Code Article 48, adopted in 2013. 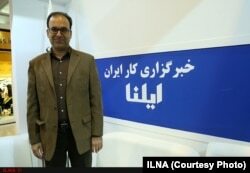 In another interview published Tuesday, by state-run news agency ILNA, Iranian Bar Associations Union head Morteza Shahbazinia said if the list is confirmed, it will "severely undermine" what he called the basic right of Iranians to choose a lawyer from among the tens of thousands certified in Iran. Morteza Shahbazinia, head of the Iranian Bar Associations Union, has criticized the judiciary's reported decision to approve only 20 defense lawyers to handle national security cases. "(Judicial authorities) also would be unduly discriminating between public attorneys and the selected individuals, who would be given many advantages (in their work)," Shahbazinia told ILNA. He also called on the Iranian judiciary to either eliminate Article 48 of the penal code or modify it immediately. The Iranian Bar Associations Union was created by the Iran Bar Association in 2003 to coordinate activities of the nation's main organization for lawyers around the country. Iran-based lawyer and human rights advocate Nasrin Sotoudeh also spoke out against the list of vetted defense lawyers in a separate interview with CHRI published on Monday. If the law that enabled the creation of the list is not revoked, she said, "a number of lawyers have declared their readiness to stage a sit-in protest." Sotoudeh also criticized the government list for not including any women or advocates for the legal defense of political and social activists. One of the government-approved lawyers came under scrutiny from a former Iranian attorney who is active on Twitter. In a tweet posted on Monday, Ali Mojtahedzadeh singled out Abdolreza Mohabati, who served as deputy to Tehran's then-chief prosecutor Saeed Mortazavi in 2009. Mohabati and Mortazavi presided over a harsh government crackdown on weeks of mass opposition protests in Tehran in the aftermath of Iranian President Mahmoud Ahmadinejad's disputed 2009 re-election win. In his tweet, Mojtahedzadeh said Iran's judiciary authorized Mohabati in 2009 to act as a defense lawyer for the same political activists swept up in the crackdown of the Tehran prosecutor's office. Mojtahedzadeh ended his tweet with a sarcastic hashtag about Mohatabi's latest appointment, saying "big surprise, an insider lawyer."